We got up early today to head out on a mini road trip. 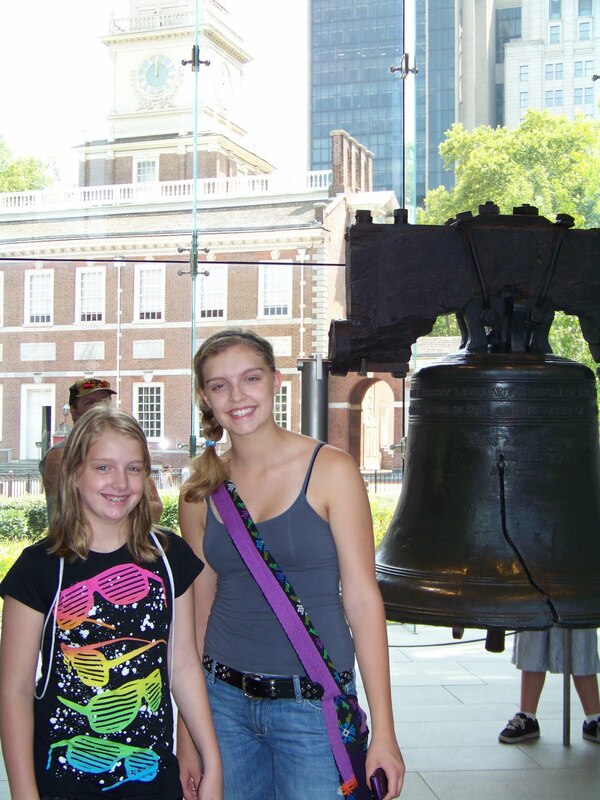 We were heading to Philadelphia to see the historic sites that city has to offer. We weren’t sure we wanted to get back in Grizzy for another ride, but figured we’d come this far, what was another 4 hour round trip? Besides, Bre’s favorite subject is history so this part of the trip was for her. Before we left, we had to say goodbye to Carrie, Ryan & Mason. We had so much fun with them, and are so happy that they were able to join us for a few days of our vacation. We’ve missed them since their move to North Carolina, and have wished we could see them more often. I secretly (ok, not so secretly since I tell Carrie the time) hope they will move back to Minnesota, but know that isn’t likely to happen. I will keep hoping, though. When we arrived in Philadelphia, I picked up our tickets four our tour of Independence Hall while Jim found a place to park Grizzy (not an easy task in downtown Philly). I met the rest of the family out front of the Hall, we went through security, looked around the park a bit, and got into line for our 11:45 tour. The tour guide called for the 11:30 tour. Then, to our good fortune, he said he had a few spot left on this tour. We were able to join them. That was much better than standing out in the sun for another 15 minutes. The tour was fascinating for all of us…ok, not so much for Van. He mainly wanted to play with his cars. Someday, maybe, he’ll appreciate looking at the pictures at least. I’m sure he’ll have some history project he can use them for. 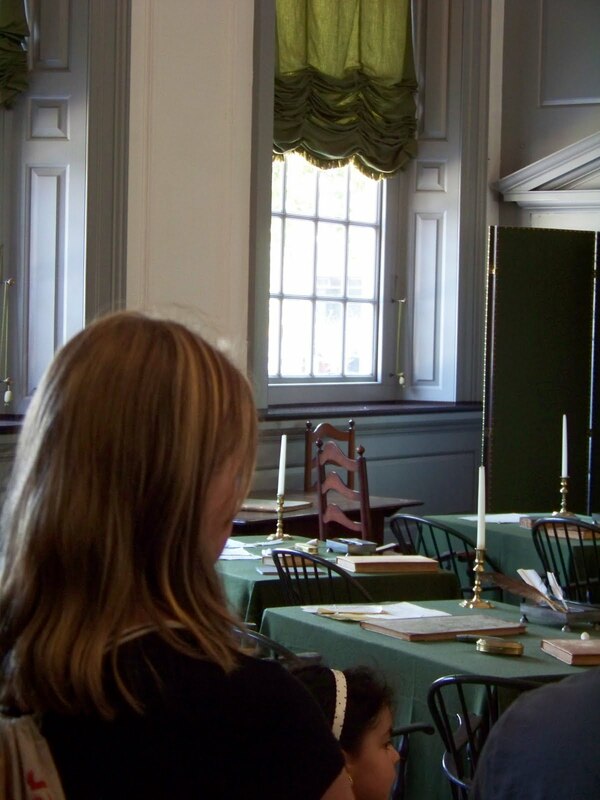 It was a little overwhelming to realize we were in the place where our Founding Fathers signed the Declaration of Independence, voted to fight for our country’s freedom, and drafted the Constitution. When we went to the second floor, we sat in a ballroom. We learned that during a time in the Revolution, the British controlled the Philadelphia area and that ballroom was used as a holding area for injured American soldiers who were prisoners of the British. The soldiers had little food, inadequate clothing, were given a thin layer of dirty hay for a bed, and had almost no heat. Most did not make it through. Their bodies were carried out and across the street, to what is now Washington Square, where they were buried in shallow graves. Hearing their story was very humbling. Once again, I was reminded that freedom is not free. It comes at a great cost, and that cost is still being paid today as our soldiers are stationed and fighting around the world. From our tour, we found our way to City Tavern. City Tavern was a place where the Founding Fathers would meet to eat, drink, and discuss politics (and many other things, I’m sure). The original building was destroyed, but the current building is a complete replica. When you walk in, you immediately feel you have been transported back in time. The furnishings, curtains, table settings, and uniforms of the servers are all authentic to a time 200+ years ago. It is a wonderful place, not only for the ambiance, but for the food. 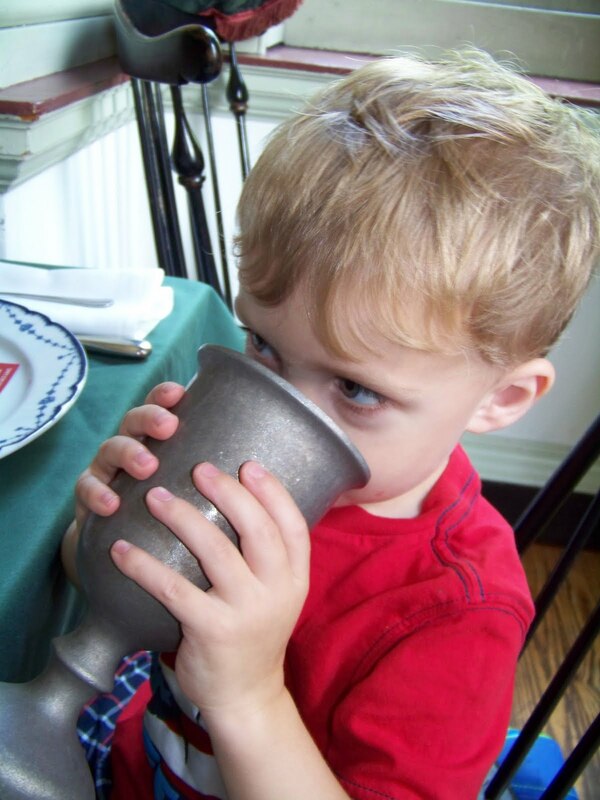 The menu consists of authentic dishes from the 1700s and 1800s. We tried a variety of items and were all pleased with our choices. 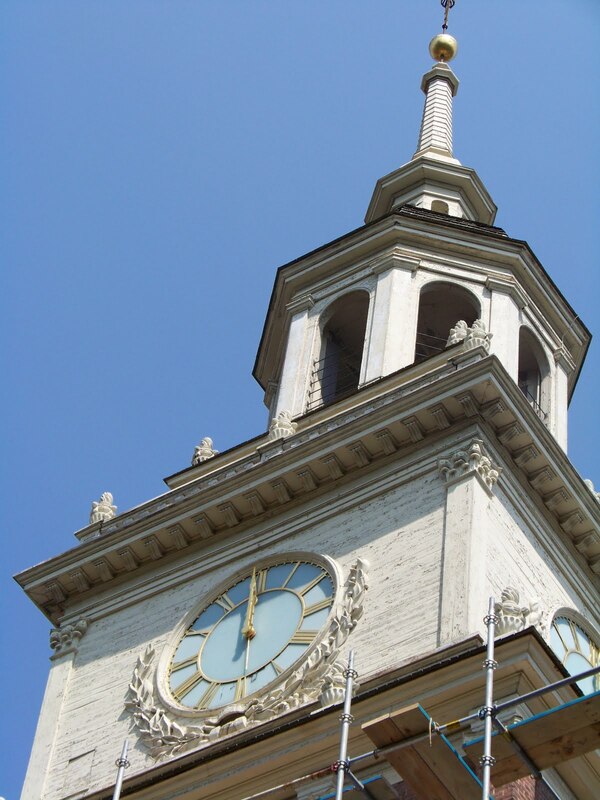 We highly recommend City Tavern to anyone traveling to Philadelphia – whether you’re a history buff or not. Following lunch, we found our way back towards Independence Hall. We wanted to see if we could get in to see the Liberty Bell. Earlier in the day, there was a line around the block to get into the building. We were thrilled when we approached the building and saw there was no line at all! Apparently, 2 pm is the best time to see the bell if you want to avoid a crowd. We wanted to make one last stop in Philly before we headed back to Hershey. Jim wanted to bring the girls to the Philadelphia Museum of Art. This is not because he is a huge lover of art. It is because of the Rocky movies. This is where the stairs scene was filmed. At the top of the many, many steps, you find 2 feet on the ground. That’s where Rocky stood with his arms raised in his triumphant pose. 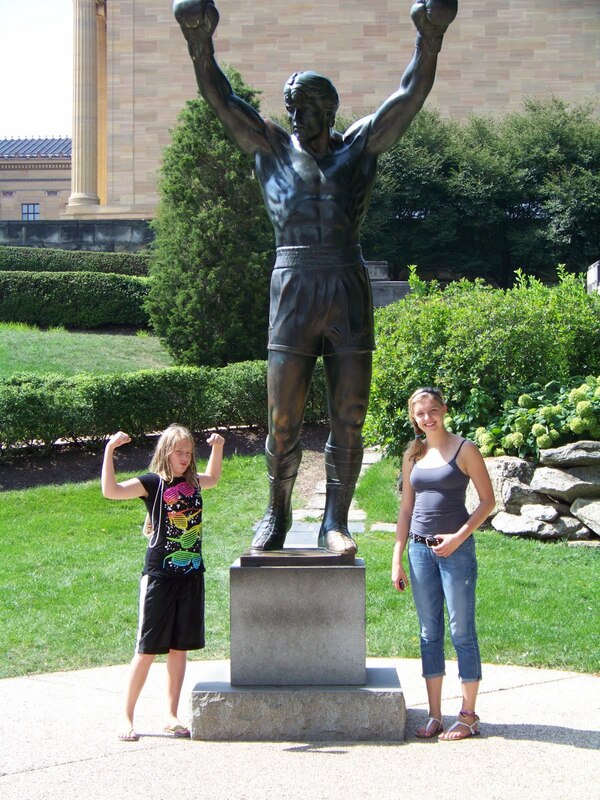 There is also a statue of Rocky. Of course, these are great photo ops and Jim took full advantage. Notice… I said Jim. I used Van’s nap as an excuse not to climb the steps. I also said I would drive around while they went to the top so we didn’t have to worry about parking. And when I said drive around, I literally meant drive around. The museum sits on one side of a round-about. I drove around it 3 times while they were on the steps. During this time I really felt like a Griswold. It reminded me of their European Vacation and how they got trapped on a round-about in France. Upon descending the stairs, Jim, Bre, and Brooke piled into Grizzy and we were headed back to Hershey. The trip back started and ended with frustration. At the start, we were behind 2 semis that rode side-by-side… at 20-40 miles per hour. There was no traffic in front of them, but miles of traffic behind. I was second in line behind them. I was not happy! It was as if they were purposely starting a traffic jam. I don’t know if they wanted to plan their dinner stop and didn’t have cb radios or what, but I was so relieved when they got off at the same exit and traffic could flow freely. When we got close to Hershey, I must have been daydreaming a little too much. I missed our exit. In Minnesota, this would be no big deal. We could take the next exit which would be just a mile or two down the road. However, you really don’t want to miss an exit on the Pennsylvania Turnpike. There’s no way to turn around. The next exit was 20 miles down the road! Fortunately, it wasn’t that far out of our way to go from that exit back to Hershey, but it did add a little time to a trip that was already longer than it should have been thanks to the aforementioned semi trucks. For the rest of the evening, Van and I relaxed at the resort. Jim and the girls went to Hershey Park. The park offers a free preview if you arrive within 2.5 hours of its close and purchase tickets for the next day. It is a pretty good deal. They were able to scope out the coasters (Jim is a coaster fanatic) and get a “lay of the land.” When they returned to the resort, they shared their plans for the next day when we all were going to go to the park. Jim informed me that he was able to buy me a ticket at a special price. It’s a companion ticket, specifically designed for pregnant women or parents of small children who can’t ride all the rides. My role was to take Van on the kiddie rides so he could enjoy the park, Jim’s role was to take Bre and Brooke on the rest of the rides so they could enjoy the park. Some people may think Jim got a better deal here, but I didn’t mind at all. I was looking forward to a relatively calm day in the amusement park. Next Rain, rain go away!